GearWorld is a youtube friendly template, recent post thumbnails will be replaced from Youtube embed video, All Videos inside post area will appear as responsive. Gear World template's main color is set as blue, which can be changed by simply going on layout option. Main slider on home page and all other widgets are created with lighter weight scripts, that makes Gear world blogger template to load absolute faster. Social buttons are fixed on top right with back to top navigate option. 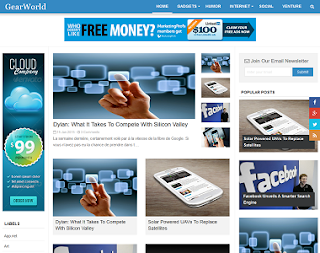 Gear World Blogger Template is specifically designed for tech blogs, geek updates, games, gallery and personal blogs.